As an avid gastronome, there are defining moments in my culinary experience that transcend the limits of what I thought possible. A meal is no longer just a meal, but an event. One that can change the diner forever. For years I have kept wish lists of restaurants I had hoped to try, and slowly but surely I have been making progress. There are a few restaurants that are more difficult to check off the list, whether they are more challenging to reserve tables or out of my price range. Until recently, Eleven Madison Park fell into that category. Their $74 four course lunch prix fixe was on my mind (four courses at dinner cost $125, and the tasting menu is even more), but they are only open for lunch on weekdays. I had a full time job that did not allow for such extravagant (and lengthy) weekday excursions, but as soon as I knew that project was nearing an end, allowing me a more flexible weekday schedule, I got on the wait list (yes, the wait list) for a reservation. Weeks passed, the day of my proposed reservation came and I had not yet heard any news, so I basically accepted the fact that I would not have the pleasure of dining at Eleven Madison Park anytime soon. Then my phone rang. Could I come in for a noon reservation that day for lunch? Oh yes I absolutely could! The world stopped. I was going to finally experience a meal at Eleven Madison Park! With its 3 Michelin Stars (the highest honor), and 4 stars from the New York Times, it has been called one of the best restaurants in the world, and I would finally get to try it for myself! From the moment the maitre d' helped push the revolving door for me, I knew I stepped into a sort of Heaven. A large open space with high ceilings and immense windows that bathed the dining room in warm light. Spacious tables covered in white linens. Men dressed in suits. Time stood still as I was escorted to a very large table that I would share with no one. It would be all mine. I felt like a million bucks. From my seat, I had a clear view through the giant windows of a New York City landmark, the Flatiron Building. As far as landmarks go, Eleven Madison Park itself is housed in a historic New York building of its own. The MetLife Building was built in 1931, and easily promotes Eleven Madison Park's reputation as a window into the soul of the New York City dining scene. It takes the best of the classics and breathes new life into them, allowing Eleven Madison Park to shine as bright as the New York City sun. The menu at Eleven Madison Park (EMP) is unlike any other I've encountered. Instead of selecting dishes off an extensive and detailed list, diners are presented with four rows of main ingredients to choose from, one per course. The resulting dishes will feature that main ingredient, but are somewhat a mystery to diners. The kitchen has a blueprint for the dishes they plan to make for each ingredient, but can easily fluctuate based on diners' preferences and dietary restrictions. My dining room captain Kevin noted that although I have no dietary restrictions, I am not too keen on dill and tarragon. Thus, he would ensure the kitchen omitted them from the dishes I would be served. For my four main courses I selected foie gras, lobster, beef, and chamomile. Kevin also inquired whether I would like a classic cold preparation for my foie gras or a less traditional hot one. I told him to surprise me. My beverage of choice, in addition to water, was iced tea. It was served with simple syrup for sweetening. I'd love to point out that unlike some other restaurants in the city that charge you for each iced tea, EMP gives you free refills. This may seem like a silly thing to point out, but after paying $8 at the Russian Tea Room and having them charge the same for each additional iced tea, my $5 iced tea with free refills at EMP was a breath of fresh air. I guess they figure you are paying enough for the meal, they don't need to nickel and dime you for iced tea refills. God bless them for that. The first flavors to hit my palate came from a small box containing a black and white cookie, a classic New York treat. This cookie, however, was a savory rendition made with Parmesan and black truffle. The cookie pretty much blew my mind. The crumbly Parmesan cookies were sandwiched around an intense black truffle filling. How is it that such a tiny parcel could have such extraordinary flavors? This was the perfect start to my meal. I'd love a dozen more of these cookies! My next hors d'ouevre came as a pairing of lightly smoked apple and celery tea with a thyme bundle, and a small disc of brioche topped with a quail egg and bacon. The tea was sweet and slightly acidic, definitely refreshing. The bacon and egg portion was a single bite, but had good flavor. Overall, I enjoyed this presentation. It appeared to be their version of breakfast in a couple bites and sips. The next course contained a yogurt ice cream lollipop with curry powder and fried lentils paired with a warm chickpea panisse topped with yogurt and orange zest. The hot and cold pairing of this starter was lovely. I adored the cold and tart yogurt lollipop with the warm flavors of curry and crunch of the lentils. It surprised my palate (in a good way). The chickpea panisse was warm and silky inside, and a perfect compliment to the flavors that not only topped it but were served alongside in the form of the lollipop. There was still another treat before I got my first actual course. Served in an empty egg shell was smoked sturgeon with smoked sturgeon sabayon and chive oil. It was smoky, salty, and slightly sour, with a really beautiful texture of the small cubes of fish along with the foamy and creamy sabayon. The chive oil in the bottom of the shell was a nice surprise in color as well. This was luscious and a very delicious surprise. Next came the bread course. It was actually described as a "course" so I won't argue. Two warm butter rolls were wrapped in a cloth pocket. They were made with local whole wheat flour from upstate New York, and laminated much like a croissant, rolled and cut, yielding a rich, buttery, flaky concoction. 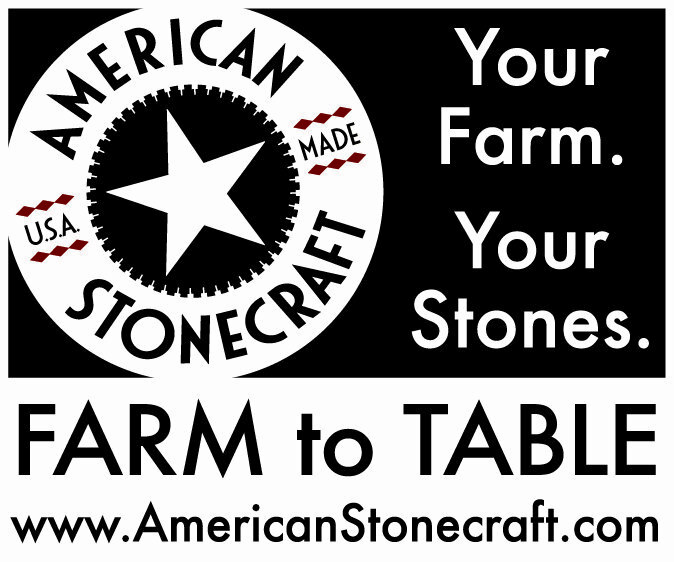 They were served with cow's milk butter topped with oats, goat's milk butter topped with a chive blossom, and Amagansett sea salt from Long Island. The bread was incredible, as were the butter options and the coarse sea salt. I thought the cow's milk butter had a slightly stronger and richer flavor, while the goat's milk butter was perhaps slightly floral. They were both excellent, and as usual a great presentation. Finally, it was time for my first official course. I had selected foie gras, and received a more traditional cold preparation, but there was nothing "traditional" about this incredible presentation. The foie gras was cured with buckwheat and buttermilk and rolled into beautiful cylinders. The foie gras itself was creamy and rich, punctuated with bites of crunchy and chewy buckwheat, a great textural contrast. Mildly pickled ramps somewhat cut the richness of the foie. Meanwhile, a toothsome buckwheat puree was matched with a fines herbes buttermilk sauce to finish off the plate, which showcased an elegant balance of negative and positive space. This dish was a piece of art both in aesthetics and flavor. Absolutely two thumbs up. My next course featured lobster. Tail and claw meat was poached in a meyer lemon beurre blanc and artfully arranged on the dish along with a charred baby leek (its roots flash fried to yield a toasty vermicelli-like texture), leek puree quenelles, a squid ink and shellfish bisque, and "dirt" made from charred bay leaves that were then pureed, folded into brioche dough, baked, dehydrated, and then crumbled. It appeared that the leek was growing out of the ground. Not only was this yet another stunning display of creative plating, but the flavors were perfection as well. The charred bay leaf crumble was a nice surprise in texture (which, along with the fried leek roots, were a great contrast to the smooth leek puree and delicate lobster meat), and tasted perfectly charred but not burnt at all. The beef course showcased a piece of ribeye aged 55 days. It was served with a melange of tiny beach mushrooms, peanut potatoes, sorrel puree, shallot crumble, and a sauce bordelaise with cubes of bone marrow. The sorrel puree was herbaceous and slightly citrusy, offering a nice bright contrast to some of the heavier ingredients on the plate. With the exception of one too-chewy hunk of fat in my beef, the rest of the cut was tender, and juicy. The miniature accompaniments on the plate were elegant and arranged nicely. At this point in the meal, I was invited by the service director Kirk Kelewae to a private chef's table in the kitchen to experience an edible cocktail inspired by a classic New York drink. This was a "special" addition and not something that every diner would get to experience, so I'm really thrilled I got the opportunity to peek into the Eleven Madison Park kitchen and have an extra treat. Christine, one of the pastry cooks, prepared EMP's rendition of a Jack Rose, a cocktail created for a famous gambler named Jack Rose in the 1920s. Typically the drink would contain apple brandy, grenadine, and lime. For this updated version, Christine used liquid nitrogen to make an apple brandy sorbet. She also took some pomegranate mousse and froze it in a ladle in liquid nitrogen to make a sphere. Lemon-soaked apple cubes went into a glass with some lime syrup and then were topped with the apple brandy sorbet and the frozen sphere of pomegranate mousse. The liquid nitrogen "smoke" was still escaping from the glass as I cracked the pomegranate mousse sphere with my spoon and began to dig in. This was such a delicious and exciting presentation of a classic New York cocktail, and I can't get over how exciting it was to actually have this glimpse into their kitchen. Definitely a highlight! When I returned to my table, my captain Kevin presented me with another rendition of a classic New York drink. His table side preparation of an updated egg cream once again illustrated Eleven Madison Park's deep-rooted connection with the city of New York, cementing its title as the quintessential New York City dining destination. Instead of the traditional chocolate component, Kevin started with an orange syrup, adding to it a cocoa nib-infused local farm-fresh milk, a dash of orange oil, and finally seltzer water. I had never had an egg cream before (which doesn't actually include any egg), but I must say that I found it incredibly refreshing. It reminded me of a fizzy creamsicle, in the best possible way. Next, I was treated to EMP's version of a New York cheesecake (are we clear on the classic NYC theme here?). This variation featured goat cheese, a blood orange sorbet, and vanilla snow. It was topped with what resembled a candy cigarette (remember those?). The dish was slightly tangy and very refreshing. I loved the textural contrast between the creamy cheesecake base, the slightly gelatinous blood orange layer, the cool blood orange sorbet, and the crunchy snow on top. And to think, this wasn't even my dessert course! It was a pre-dessert. My dessert selection featured chamomile as the main ingredient. A chamomile milk yogurt sorbet was the focal point of the dish, along with some very thick rice pudding, lime and jalapeno. Overall the dish was creamy and mild, with a crunchy salty touch in the salted graham cracker crumbs on the plate. Two thin slivers of jalapeno added a bit more depth. Sweet, sour, salty, and spicy flavors all played well with each other in this dish. After the dessert course, I was gifted another small box--this one containing their sweet version of a black and white cookie. It had a note of citrus as well in the cookie which definitely brightened up this traditional NYC treat. The fact that the black and white cookies were essentially bookends to the meal was a brilliant strategy. My hand-written check was accompanied by a jar of their homemade granola, a treat, I'm told, just for their female guests. Why just for the ladies, I asked? It's about chivalry. It's good to know that even in the middle of Manhattan chivalry is definitely not dead. I loved noshing on this granola for days after my visit, and plan on making it myself soon (the recipe is in the Eleven Madison Park Cookbook)! 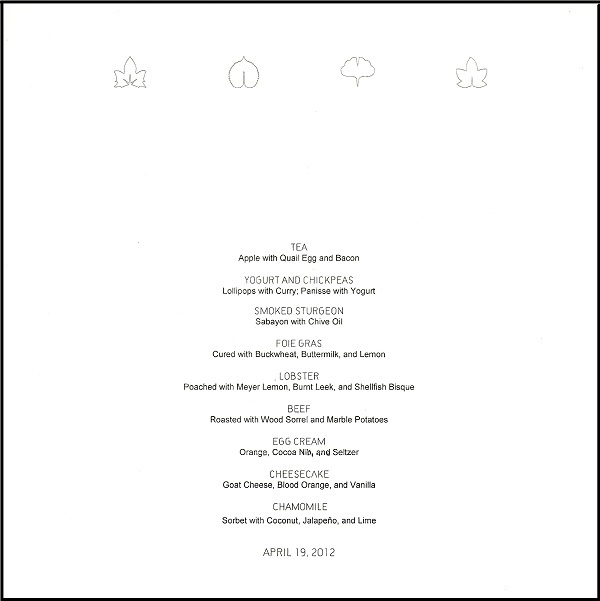 A final treat from Kevin and the fabulous folks at Eleven Madison Park, a printed out documentation of my entire meal. This is not a common feature, and once again I couldn't be more flattered that they took an extra step to ensure my remembrance of the entire experience. It definitely was an unforgettable 2 1/2+ hours of my life. The price tag is a steal for what you will encounter at Eleven Madison Park. This isn't just a meal. It's an event, an experience... of falling in love.